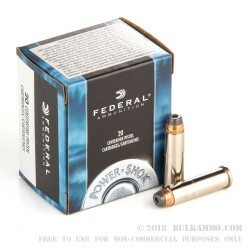 Power-Shok is a long-standing staple in the firearms, ammo, and hunting worlds. 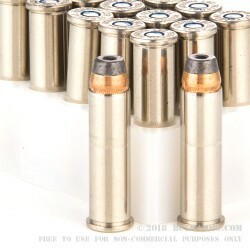 A while back, Federal Premium Ammunition was tasked with creating a line of ammo that could be made to strict tolerances at high manufacturing standards, provide the same level of accuracy as many of the more expensive loads, and take down the same game animals that Federal is known for taking with those specific cartridges. The resulted family of cartridges was the Power-Shok line, and it was an instant hit with hunters and target shooters all over the USA and the world. 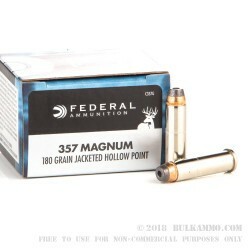 These Federal 357 Magnum cartridges are topped with the 180-grain bullet featuring a thick lead core wrapped in a Copper Jacketed Hollow Point (JHP) shell. 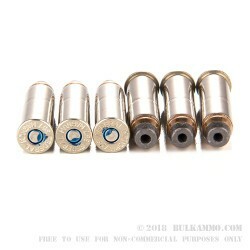 Every Jacketed Hollow Point bullet is loaded into a thick walled, new production, reloadable, Boxer primed non-corrosive, heavy duty brass case. These rounds have a muzzle energy that leaves the muzzle at 466-foot pounds, and the muzzle velocity these rounds have is a shocking 1,080-feet per second. They come in the usual 20 round boxes that are small enough for you to stock up on for your trips to the range, shooting competitions, hunting, or even self-defense. Grab yourself a few boxes today!